Joining PYP is easy! Visit the member portal to create your account and submit your application. If you still have questions, feel free to reach out below! Questions about your membership or need to register for an event? Visit your membership portal to view and change your membership information, learn about and register for upcoming events, and change your payment and personal information! If you've forgotten your password, you can reset it here. If you're still having trouble logging on, let us know below and we'll get it taken care of right away. Are you a business, entrepreneur, or local leader who would like to partner with PYP? We would LOVE to talk with you about that! You can visit our sponsorship page, or better yet - drop us a message below. Partnership doesn't look the same for everyone, and we want to see how we can make the most out of our relationship! Do you have an event, job, or something else amazing happening in the Pensacola Bay Area? That's awesome! We'd LOVE to hear about it and if it fits within our criteria, we'd love to promote it for you! The fastest way to get your event, job, or community opportunity to our members is to submit to our Community Opportunities page. We'll review to see if it fits our criteria, and then post to our page. We will sometimes push these opportunities to our social media. If you have additional questions after submission on our Community Opportunities page, let us know! Do you have a question about one of our events? We'd love to help answer any questions you might have! Drop us a line below. If you're looking for our current events, check our homepage, our Facebook, or our events page! Would you like to host an event with us? Let us know below! Do you have an event, job, or something else amazing happening in the Pensacola Bay Area? That's awesome! We'd LOVE to hear about it and if it fits within our criteria, we'd love to promote it for you! The fastest way to get your event, job, or community opportunity to our members is to submit to our Community Opportunities page. We'll review to see if it fits our criteria, and then post to our page. We will sometimes push these opportunities to our social media. If you have additional questions after submission on our Community Opportunities page, let us know! Every month, we will be highlighting some of the wonderful companies who support PYP. We truly could not be a catalyst for positive change in our community without their continued support. This month, we are spotlighting Cowork Annex. Cowork Annex has opened their doors to us this year to host events and our monthly board meetings. A heartfelt thank you to Cowork Annex for believing in PYP, our mission, and our members. Tell us a little about Cowork Annex. Cowork Annex is a shared community workspace for collaborative, creative, entrepreneurial types. Located in 10,000 sq ft on the second floor of the Brent building, the annex has day desks, dedicated desks, offices, meeting rooms, and an event space; all you need to help your business thrive, to include the fastest wifi downtown and great, free coffee. How does Cowork Annex act as a catalyst for positive change in our community? Coworking makes for a more productive, flexible, socially-connected and, so happier, individual. The combination of a well-designed workspace and an enjoyable work experience are part of the reason people who cowork demonstrate higher levels of thriving than their office-based counterparts. What matters the most for high levels of thriving is that those who cowork have substantial autonomy and can be their “best selves” at work. The result is people who feel more committed to their organization/purpose, and are more likely to bring their best energy and ideas to work each day. The annex offers a safe space for connection, community, and collaboration, valuing color, class, creed, gender, and orientation. We believe in the benefits of diversity, and understand the value it brings to everyone in our community. How does Cowork Annex help to attract and retain young professional talent? We help to attract professionals by offering added value to memberships in the form of workshops, wellness, professional advice, life coaching, social events, and mentorship, that are all free to members. We retain members by creating a community and business ecosystem that is hard to walk away from. We check in with each other, and encourage and support each other’s goals and growth. How does your company promote growth in the Pensacola Bay Area? We help to promote growth by offering networking and connection with a wide variety of resources. These resources are who we know, and who we collaborate with: our own members and investors, Co:Lab, UWF, Florida West, ITen Wired, IT Gulf Coast, Veterans Florida, 1 Million Cups/Kauffman Foundation, Gulf Power, PYP, The Smart Coast, amongst others. What advice do you have for young professionals who want to advance in your industry? Here’s our nugget of advice as we’re kinda new on the block too. By 2020 five million people will cowork. That’s a lot of collaborative potential and brainpower. Our advice for newbies is the same as any business; find out who your audience is, understand your audience, find out what they need, help them. Coworking caters to those seeking a more collaborative working environment, so creativity to inspire a great user experience, and providing a twist on your services, will help you stand out. By understanding your audience, and preemptively meeting their needs, your prospects will be more engaged before they even walk in. Oh, and when they do walk in, it’s all about creating that vibe; the “secret sauce”, that makes them want to stay, that’s when your brand authenticity should come shining through! Why do you partner with PYP? We partner with Pensacola Young Professionals as they share a similar vision and mission as the annex; the spirit of caring about the community. We celebrate that they are a diverse group of young professionals promoting positive change in the community, and driving it forward by helping others grow professionally. It is inspiring to be around their passion and belief in supporting our great city of Pensacola and working toward its continued change, growth, and success. Every month, we will be highlighting some of the wonderful companies who support PYP. We truly could not be a catalyst for positive change in our community without their continued support. 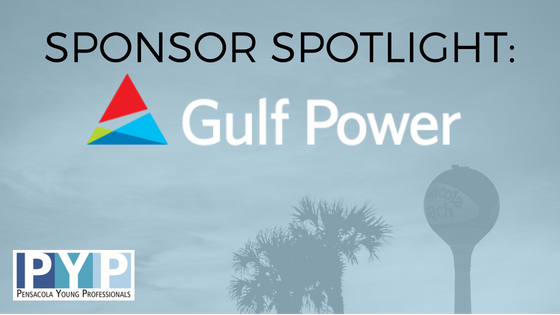 This month, we are spotlighting Gulf Power. Gulf Power has been a supporter of PYP since our founding in 2006. Not only do they help to provide funding for our events and programs, but members of their staff have helped to serve as mentors through our Mentor Pensacola program, some of their YP employees have served in leadership positions within PYP, and they have opened their doors to host several of our past events. A heartfelt thank you to Gulf Power for believing in PYP, our mission, and our members. Gulf Power is an energy provider serving almost half a million customers across Northwest Florida, from the Alabama border, to the Apalachicola River, to the Gulf Coast. Our customers are at the center of everything we do. We work hard to provide our customers with reliable and environmentally responsible energy, offer innovative energy services and solutions, and give back to the community we also call home. How does Gulf Power act as a catalyst for positive change in our community? We know we’re only as good as our people. The Gulf Power team has a strong history of supporting the communities we live in. We take pride in not only providing great service to our customers, but also in helping to maintain and enhance our region’s quality of life. We hope to better the lives of our customers through giving back, protecting and restoring the environment, and helping to create community growth. How does Gulf Power help to attract and retain young professional talent? Our future is in the hands of the next generation. We believe in empowering young people through a workplace culture that encourages innovation and growth, while also providing them with the support they need to live a full and healthy life outside of work. Having the sugar white sand beaches is also a plus for convincing young professionals and their families to make Northwest Florida home. Jobs in the energy industry involve a diverse set of skills, knowledge and experience. But it also involves a lot of customer service. At Gulf Power, our customers are also our family, friends and neighbors. We encourage young professionals to get to know their community and make connections. Pensacola Young Professionals is full of bright and passionate people with the power to make positive change in our communities. PYP’s mission matches Gulf Power’s end goal to better the lives of the customers we serve. To learn more about Gulf Power, please visit their website, or connect with them on Facebook, Twitter, and Instagram.